Payouts to shareholders of ExxonMobil, Royal Dutch Shell, Southern Company, and Six Flags Entertainment are out of balance with the state of their earnings. Owning dividend stocks can be a great way for investors to beat the market over the long term, and generate consistent cash flows as well. But all dividend stocks are not created equal, and yield, whether high or low, is not the only metric you need to keep an eye on. Another key number is the payout ratio: how much the company pays out to shareholder divided by what it generates in earnings. When that ratio (expressed as a percentage) rises over 100%, it should be a warning sign for investors. Four surprising companies with payout ratios over 100% are ExxonMobil Corp. (NYSE:XOM), Royal Dutch Shell plc (NYSE:RDS-A), Southern Company (NYSE:SO), and Six Flags Entertainment Corp. (NYSE:SIX). Here's why they probably won't be able to sustain their current dividend levels for long. For decades, big oil was a safe business, but that's no longer the case. 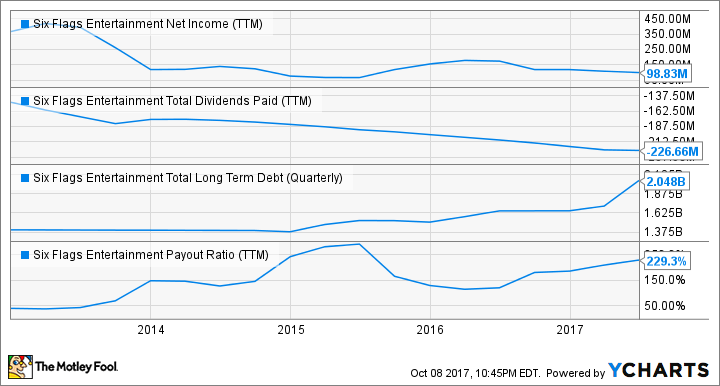 You can see in the chart below that in the last five years, net income is down, dividends paid are up (inverse in the chart), and long-term debt is up. In other words, the business is deteriorating, and ExxonMobil and Royal Dutch Shell are borrowing money to pay their dividends each year. The recent pressure on earnings has come from a decline in oil prices, driven by global oversupply. But that's not what big oil needs to worry about long term. The coming rise of electric vehicles is a real threat to oil markets, and automakers from Volkswagen to General Motors have promised to dramatically increase their EV manufacturing in the next decade. At the same time, nations including France, the U.K., and China have begun to put plans together to ban sales of new gasoline-powered vehicle within the next few decades. Even a small amount of oversupply in global oil markets of 1 million to 2 million barrels per day from 2014 to 2016 -- less than 2% of total supply -- crippled the earnings of ExxonMobil and Royal Dutch Shell. What will happen when sales of gasoline-powered vehicles fall off significantly? These are two dividends whose days are numbered. Southern Company was once considered one of the best utilities in the country, but it's made a number of bad investments in the last decade. It's still going to complete the only major U.S. nuclear project in the works today (most have been abandoned), though it's billions over budget and years behind schedule. But customers are likely on the hook for the Vogtle plant boondoggle; they're already paying for it through increases in their electric bills. But it was never able to get the technology to work as promised for its Kemper "clean coal" plant. That effort, which the company has abandoned (it will convert the plant to natural gas instead), could cost Southern Company as much as $3.4 billion. These two massive losses will hit the company amid an already uncertain period for U.S. utilities. Customer demand is no longer growing, meaning that when cost to deliver electricity to customers rises, it's spread over a stagnant base of demand. Meanwhile, traditional wholesale markets are falling apart as the supply of renewable energy grows. On top of that, customers have choices in electricity now that rooftop solar and on-site energy storage are becoming viable options, particularly in Southern Company's markets. 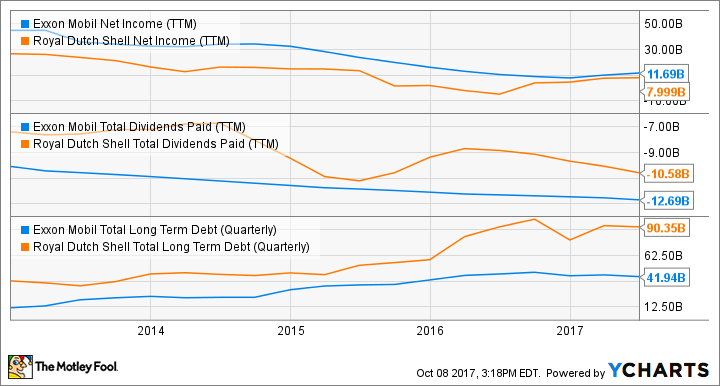 At best, Southern Company will be able to maintain its regulated earnings; at worst, it's headed for a slow decline. But no matter how you look at it, the company's dividend is not sustainable, as you can see below. The rising debt load is what investors should worry about most. If pressure continues to mount on utilities in both wholesale and utility sectors, Southern's business will continue to decline, and its dividend will need to be slashed if the operation is to stay afloat. With a strong domestic economy and low unemployment, Six Flags Entertainment ought to be at the peak of its earnings cycle. But the company has seen net income decline sharply over the past five years, during which it has borrowed money to pay out a growing dividend. You can see that the company's payout ratio is currently more than double what it earns. There are simply more places for customers to spend their entertainment dollars, and they're spending less each time they go to a Six Flags park. And getting visitors excited about its parks require spending millions to build new rides, which takes money the company is instead spending on dividends. Not only is the dividend trend not sustainable if earnings stay in their current neighborhood, it will be terrible if there's any disturbance in the economy. After the U.S. recorded its first month of job losses in seven years in September, companies may want to have some leeway in their operations in case the economy goes south. Six Flags has no such leeway, which is why its dividend won't be sustainable for long. Whether a dividend stock is paying a high yield like Royal Dutch Shell (above 5% now) or a low one like Six Flags (around 1.8%), you can't necessarily use that to gauge whether the payout is sustainable long term. It's more important to understand how a business's prospects look like, and how much of its cash flow is going toward those dividends. 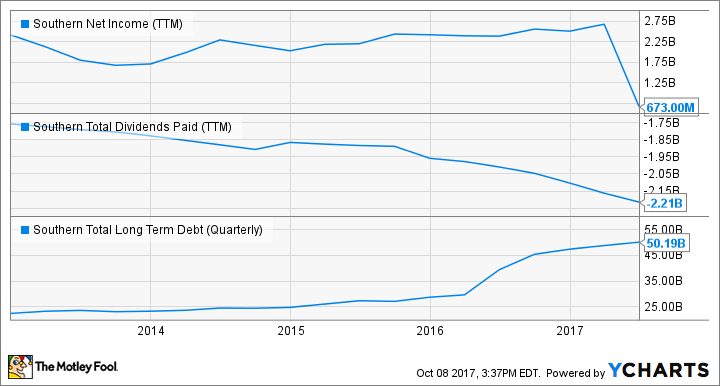 A payout ratio over 100% combined with rising debt are signs that management will soon be forced to make adjustments, and that should be a warning sign to investors.